So... how to do you decorate pumpkins at YOUR house?!? At our house, we use medical waste! We took some inspiration from our dear, sweet Laura of Houston, We Have a Problem who decorated pods for Christmas and from Noah, The Diabetes Dude, and his family who had us decorating pods during our get together this summer. This little pumpkin chick was made with pods and hot glue. Ironically, Sweets calls the hot glue "glucagon". She has test strips for eye lashes, test strips for earrings, and pods for everything else. We thought she needed a hair accessory so we added a bow! 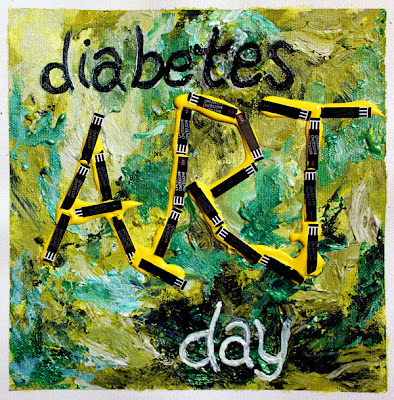 We were totally overwhelmed when Diabetes Art Day was going on... so I'm hoping that this can be our submission. It's late... but I think she's pretty cute! 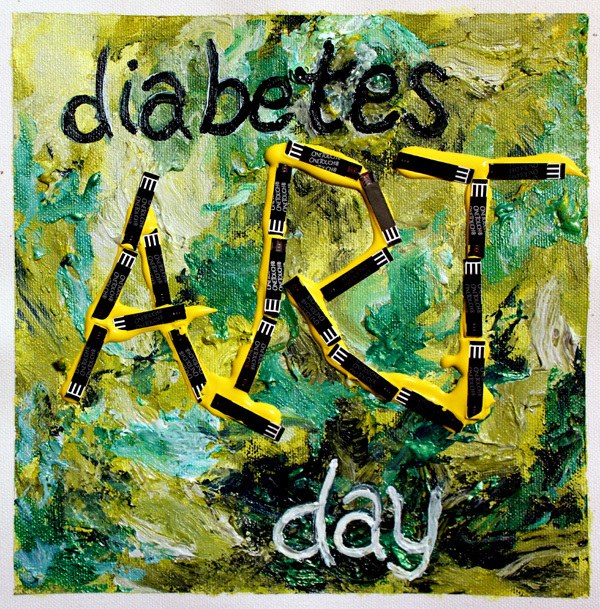 Check out LeeAnn's blog for more information about Diabetes Art Day! 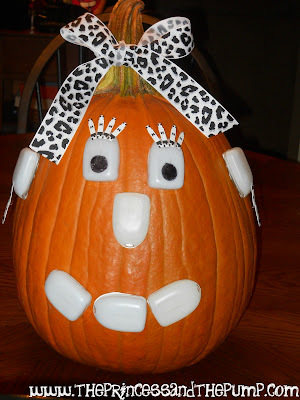 So, are you inspired to decorate your pumpkins with D supplies? I can about guarantee you that no one else on your block will have the same design! We had so much fun with this that we used some D supplies to make some more art. But you'll have to wait a few days to see that! I'll leave you with Sweetpea's current obsession.... Calling all the Monsters by China Anne McClain from Disney's ANT Farm. It's a cute song - and it gets stuck in your head. Go on and watch... you can thank me later! Your pumpkin is truly one of a kind...just like your sweetpea! Adorable pumpkin! Have to say I refuse to click the video link though, lol! My girls are obsessed too and that song was stuck in my head all day on Friday! I'm laughing! I was going to do the same thing this year!!! :) We don't have any pods, but we have a bunch of D supplies. I thought it'd be fun to do it up D style! Love your creation! ANT Farm...HELLO!!!!! Welcome to my world!!!! Haha! We LOVE that song over here too!